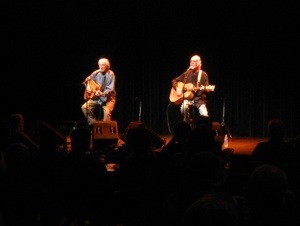 Cyndy and I went to Ft. Worth last Friday to see Brewer and Shipley at McDavid Studios. It is in a building owned or managed by Bass Performance Hall and houses smaller venues in the next block. The Van Cliburn Recital Hall is also in that building. The room we were in had a capacity of 200 people with the setup for the show. The crowd numbered less than two hundred but it was a good audience for Michael Brewer and Tom Shipley. 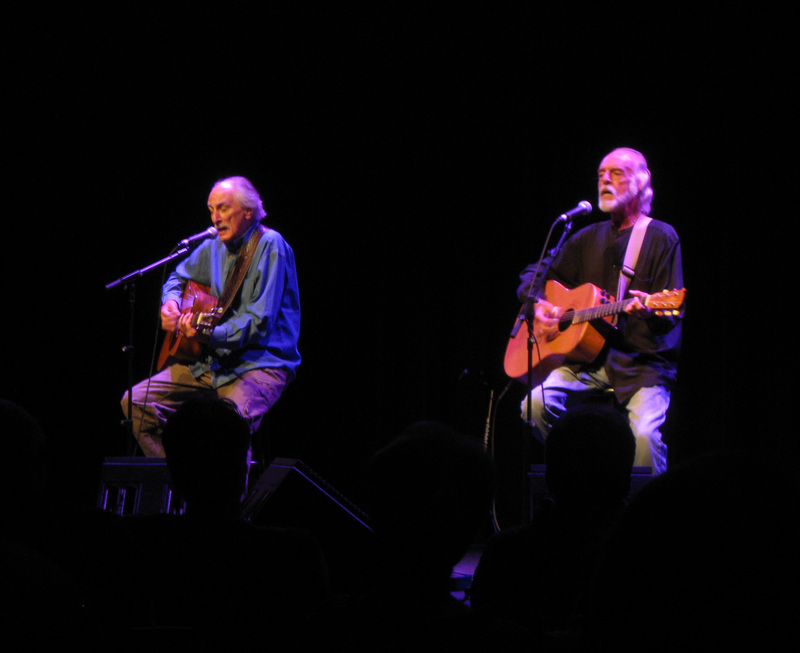 I first saw Brewer and Shipley at the Lone Star Opry House in the early seventies. Cyndy and I had our first date at Lone Star Opry House when we went to see Rusty Weir not long before or after the Brewer and Shipley show. Cyndy and I sang One Toke Over the Line in the folk club in high school – I was one of the guitarists. The next time I saw the duo was the day our youngest son was born in 1996. (We dated a couple of times after high school, but did not get married until 1992 after both of us were divorced.) Sally, a good friend of Cyndy and I, took me to see them at the original Poor David’s Pub when Cyndy had to remain in the hospital for a couple of days. They signed all of my albums, but I could not find my Brewer and Shipley songbook. They signed the songbook on Friday. Seventeen years later, Cyndy got to see Brewer and Shipley. And they sounded just as good as the past two times. 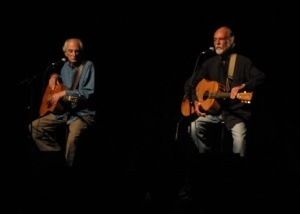 Their harmonies intertwined, as did their guitars, to create an orchestral acoustic sound. The duo began with Shake Off the Demon and followed it with Make My Bed from their Shanghai CD. Then they played One Toke Over the Line after a few stories about how they wrote the song and times when they were “several tokes over the line.” They were playing clubs in the midwest when they went out back of the club for a – well – toke break. When they were walking back into the club, Tom Shipley turned to Michael Brewer and said, “Man, I’m one toke over the line.” They wrote the song that night as a joke for their friends. It only made the album because they needed another song. Brewer came back from a trip to Mexico and found that One Toke… had been made a single and the vice president said they were the worst influences on young people of the day. Lawrence Welk had a couple sing the “modern spiritual,” One Toke Over the Line. Jerry Garcia also covered the tune. The hour and a half set included numerous stories and songs. Among others, All Along the Watchtower – “the only song we’ve played longer than our own songs” – Witchi Tai To, an Indian song from the 1800s, Streets of America, and the encore, a song by Tom Shipley, Treehouse Brown. Speaking for myself, it was a greatest hits set of my favorite Brewer and Shipley songs. Were there other songs I would have liked to have heard? Well, sure. But I trust that I will see them again – next year, not in another seventeen years.